Keywords: wound debridement; sharp technique; wound healing; pain management. Debridement describes the removal of necrotic or foreign material from and around a wound to optimise wound healing. There are many different methods that can be used to debride a wound. They can be broadly classified as surgical/sharp, mechanical, biological, chemical, enzymatic and autolytic. However, evidence supporting one method over another is lacking. Sharp debridement produces rapid results. It requires a high level of skill and experience and practitioners must have the necessary knowledge and training to complete the task safely and effectively and be able to deal with any complications as they arise. When necrotic or foreign material is present in a wound, sharp or surgical debridement can reduce the risk of infection and sepsis and aid wound healing. In this article the author considers the various methods of debridement and concludes that sharp debridement should be considered as the 'gold standard'. The term debridement comes from the French desbrider, meaning to unbridle. It was probably first used as a medical term by surgeons working several hundred years ago in war zones, who recognised that grossly contaminated soft tissue wounds had a better chance of healing (and the soldier surviving) if the affected tissue was surgically removed to reveal a healthy bleeding wound surface. A modern definition for such sharp methods of debridement is the removal of dead or necrotic tissue or foreign material from and around a wound to expose healthy tissue using a sterile scalpel, scissors or both. It can be performed as a surgical procedure in the operating theatre, involving extensive and aggressive removal of tissue with or without general anaesthesia (surgical debridement), or be more conservative, involving repeated minor tissue sparing debridement that can be performed at the bedside or in a procedure room (sharp debridement). Although surgical debridement is rapid and can involve the removal of large volumes of tissue at one time, sharp debridement should be considered as the gold standard as it can reduce the risk of wound complications and aid the healing process. Necrotic tissues retard wound contraction, the principle contribution to wound closure when wounds are left to heal by secondary intention. It can sometimes be difficult to determine whether the tissue covering a wound is physiological, such as a scab, or a pathological eschar, which is having a negative impact on healing. Attempts to aid clinical recognition have included the injection of supravital dyes, tissue oximetry, Doppler techniques, and even biopsy. Gangrenous, necrotic, ischaemic and devitalised tissue all need to be removed by debridement. Although it is widely accepted that wound debridement is necessary for optimal wound healing, evidence for the effectiveness of different methods of debridement (Box 1) from randomised controlled trials is lacking and methods of measurement are poorly developed. If dressings or enzymatic agents are to be compared with surgical and sharp debridement, careful definitions will need to be agreed upon which are reproducible and measurable. Surgical and sharp using scalpel and scissors. Highly selective with rapid results. Should only be undertaken by a skilled practitioner. Mechanical such as hydrotherapy and wound irrigation. Rehydration can ease removal of the surface eschar and removes surface debris. However, these are relatively slow techniques and there is little evidence to support their use. Potential for cross infection needs to be considered if using hydrotherapy. There is also a theoretical risk of fluid embolism and promotion of infection if irrigation is too vigorous. Autolytic using hydrocolloids and hydrogels. Rehydration of necrotic tissue through the use of a hydrogel or by keeping the wound moist, and removal of devitalised tissue using the body's own enzymes. This method is in common use but prolongs the time needed for debridement. Enzymatic using preparations such as streptokinase or streptodornase or bacterial-derived collagenases. Streptokinase and streptodornase aim to break down and rehydrate necrotic tissue, but despite being available for more than 30 years, there is little evidence to support their use over alternative methods. Also, the need to score the eschar before application may increase the risk of damage. Bacterial-derived collagenases show great potential and may promote healing. Biological such as maggot therapy. The larvae of Lucilia sericata (greenbottle fly) digest necrotic tissue and pathogens. This technique is rapid and selective, although much of the evidence to support its use is derived from anecdotal reports. Chemical such as hypochlorite. No longer widely used as application can be painful and underlying tissue is damaged. Practitioners undertaking sharp/surgical debridement must have the knowledge and skills to complete the task safely and effectively and be confident in their ability to deal with any complications that may arise. They will need to have a good knowledge of the anatomy in the region of the wound; there are clear areas of risk when arteries, veins or nerves are near the surface. Figure 1 shows an example of where good anatomical knowledge is required for sharp debridement to be achieved safely. Figure 1 - Area of skin necrosis after extravasation of intravenous fluid. Careful assessment is essential before taking the decision to debride a wound, particularly as there are some instances when necrotic tissue should be left in situ. For example, when there is underlying vascular disease with associated gangrene it is conventional to wait for a line of demarcation. The degree of underlying ischaemia should be assessed and corrective vascular surgery considered. It is also possible that necrotic material may auto-amputate itself (Figure 2). 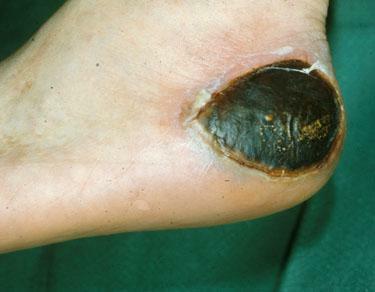 Early intervention can precipitate wet infected gangrene which spreads proximally and may need an urgent higher amputation. 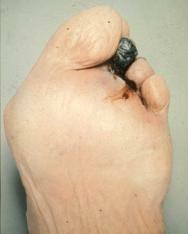 Figure 2 - Mummified toe. Full thickness dry pressure sores usually need excision after softening with appropriate dressings (Figure 3). However if the patient has a terminal illness, it may be beneficial to leave the necrotic 'caps' in place, especially if they are not causing discomfort and there is no wound malodour or exudate. Although the wound will not heal with the necrotic tissue in situ, any potential benefits should be balanced against the need for increased intervention and possible disruption to the patient if the 'caps' are removed. 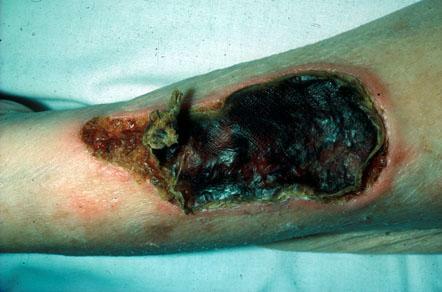 Where there is a combination of dry cap and cellulitis, exudate or odour, antimicrobial therapy should be considered to control the symptoms and alleviate the physical and psychological suffering of a patient with a malodorous wound. Care should be taken if a wound is showing clinical signs of infection. Figure 3 - Pressure sore on the heel with black, full thickness 'cap'. The possible benefits of other methods of debridement should be considered alongside sharp or surgical debridement. Sharp techniques can often benefit from being implemented after preparation with non-sharp methods for the removal of devitalised tissue (Box 1). For example enzymatic preparations such as collagenase can help free adherent necrotic tissue from a granulating wound bed and hydrocolloids soften dried eschar and can aid surgical removal, reducing the need for anaesthesia. Careful explanation of a debridement procedure together with an agreed place and time can reduce apprehension and promote confidence in the patient and the practitioner. If anaesthesia is required it is important that this is given appropriately. For local anaesthesia, a topical anaesthetic cream such as EMLA or injection of a local anaesthetic using ring block or regional techniques can be used. General anaesthesia is preferable for extensive debridement, particularly if another procedure is being considered such as closure with a skin flap. It is important that the general fitness of the patient is considered and some patients may elect to have general anaesthesia. Wide debridement may not require general anaesthesia and spinal or epidural anaesthesia can be considered. No anaesthesia may be required if dead tissue is non-adherent, but excision of too much tissue or the opening of a joint may carry complications. The removal of a dead tendon usually requires anaesthesia. Patients with diabetes may have associated neuropathy which permits surprisingly extensive debridement without causing pain. Paradoxically, however, there may be a heightened sensitivity to stimuli so pain relief should always be considered. the location of the wound in relation to the surrounding anatomy. When taking consent it is important that the patient understands what is to be achieved. To try and undertake too much at once can diminish confidence between patient and professional. Is it necessary and what form should it take? The patient should be assessed for the risk of possible complications. Sharp debridement is a surgical procedure and will involve some bleeding, although local pressure with a finger is usually enough to stop this. The application of successive layers of gauze can hide considerable haemorrhage and is ineffective. Tourniquets are dangerous and should be avoided. Sharp debridement should take place in a controlled environment with adequate lighting and equipment. Help should be at hand in case of complications. Bleeding is excessive or the source is unclear. This is a complex undertaking and should involve a team approach including the diabetologist, vascular and general surgeon, specialist nurse, podiatrist, dietician and others. Diabetes is associated with small and large vessel disease, an increased risk of infection and poor healing. In foot ulcers there may be an underlying neuropathy (Charcot's joints). Patients need careful assessment with control of their diabetes and infection. Repeated appropriate debridement can avoid the need for proximal amputation with the attendant huge drain on resources for rehabilitation. Sharp debridement is a highly skilled procedure and junior doctors and practising nurses are justifiably reluctant to undertake this technique without adequate teaching and support. However this method of debridement should not be avoided simply because there is no one prepared to perform it. Instead it must be included in the holistic care of the patient and be dealt with by the clinical team. Change is needed in the way that debridement skills are taught. Few courses exist and those that do largely cater for those who already do, or who are prepared to undertake, surgical debridement. Leaper DJ, Harding KG, editors. Wounds. Biology and Management. Oxford: Oxford University Press, 1998. Falanga V, Harding KG, editors. The Clinical Relevance of Wound Bed Preparation. Berlin, Heidelberg, New York: Springer-Verlag, 2002. Cherry GW, Hughes MA, Ferguson MWJ, Leaper DJ. In: Morris DJ, Woods WC, editors. Oxford Textbook of Surgery (second ed). Oxford: Oxford University Press, 2001.